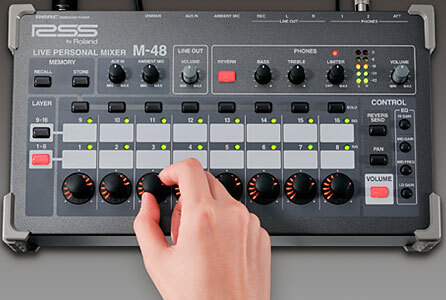 So maybe my previous post about the RSS V-Mixing system Personal Mixer was a bit premature. However, on Monday, it hit RSS' website, and is now officially announced. And honestly, it looks better than I expected. As I've written previously, the main limitation of the Aviom is 16 channels. The M-48 gets around this by making all 40 channels on the REAC network available as 16 Stereo groups (meaning each group, as a whole, can be panned L or R). Each personal mixer gets it's own selection of channels. You can send individual channels, aux mixes, DCAs or even a set of individual channels to a group (ie. combine all the Toms into a single group). That part is cool, but they added some other features--some small, others not so small--that really make it shine. First, there are 2 headphone outputs on the back; a 1/4" and 1/8". This means one fewer adapter to keep track of, or makes it easy to have two musicians share a mixer. They also included a balanced stereo pair of 1/4" outputs for driving a wedge or hotspot. Each mixer has a 1/8" record out and a 1/8" aux in. Finally, and this is brilliant, there is an ambient mic right on the back of each mixer. This would make it easier for on-stage communications, or just getting a sense of the room. The mic has it's own dedicated volume control. Also included is reverb for any of the groups. A 3 band, semi-parametric EQ is on board. And it has an adjustable limiter. As previously reported, it works (actually, it only works) with the proprietary RSS 1 in, 10 out switch, the S-4000D, that supplies both the REAC signal and power to up to eight M-48s. They call it "Embedded Power," but it sounds a whole lot like Power over Ethernet to me. Either way, it eliminates a lot of wall warts. Oh, and I almost forgot. The FOH engineer can monitor and take control of each personal mixer in case a musician gets in trouble. I can't think of anything else they might have added. They even include the mic stand adapter in the box. This system opens up a whole new set of possibilities for church sound. Overall, I'm still really excited about this, and am looking forward to getting my hands on a system. I have not heard details of pricing or availability, other than it will be "competitive" with Aviom. So there you go. Check it out at RSS America's web site.